We had the pleasure of meeting Cara Tilton the Veterans Outreach Program Specialist for the Vet Center. The Vet Center opened in Binghamton in 2008 as a community-based counseling centers, and part of the U.S. Department of Veterans Affairs, that provide a wide range of social and psychological services including professional readjustment counseling to Veterans and families, military sexual trauma counseling, and bereavement counseling for families who experience an active duty death. Vet Centers offer counseling, outreach, and referral services to eligible veterans, in order to help them make a satisfying postwar readjustment to civilian life. All services at the Binghamton Vet Center are FREE and CONFIDENTIAL to any Veteran who walks through the door or calls. The Art Show/ Open House which was a free event for the public. Tilton said “We chose an art show as it highlights two of the mediums used to help Veterans readjust and find an outlet. Two of the people displaying their arts were Petty Officer 3rd Class Ambrose Lynch and Specialist Lucinda Lehr. Petty Officer 3rd Class, Ambrose Lynch was a Hospital Corpsman in the U.S. Navy, who treated the wounded and cared for the sick. He served at camp Lejeune, NC (67-68) and served one tour in Vietnam on the USS Repose AH16, during the war (68-69). Specialist Lucinda Lehr served in the U.S Army as Military Intelligence from 1980-1985. She is an artist that plays guitar in the Vet Center’s Music for Wellness group. 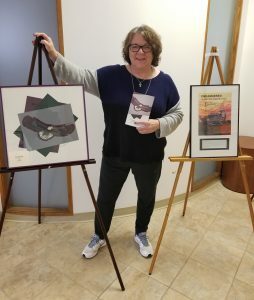 Lucinda says, “I enjoy my art and music because it keeps my hands and mind busy. 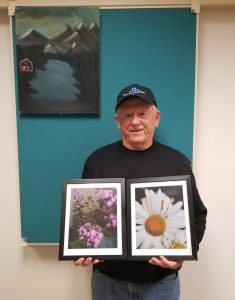 It allows me an avenue to help others with art and their creativity.” Lucinda is also a volunteer at the Binghamton community Based Outpatient Clinic and the Vet Center and clear Path for Veterans. If you would like to know more information about the Vet Center please call 607-722-2393.